I'm a total Type A... crocheting while watching a movie, working out while watching TV, and writing this blog post while watching K play Injustice: Gods Among Us (the new DC universe fighting game by the Mortal Kombat team). As soon as I wake up in the morning, my brain starts churning with all the things I need to do. And all through the day, I keep adding to that list so that as soon as I finish one task, I'm already queuing up the next. Good thing I don't have realistic dreams, or else I'd be working in my sleep as well. 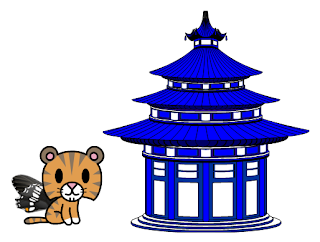 My dreams are always pretty fantastical... like winged tigers giving me a tour of my newly purchased pagoda. Ever since Dexter was born, I've been even more hard-pressed to fit in fun time of any sort. However, now that Monster Hunter 3 Ultimate is out (and is a game that K and I can co-op together) I'm pretty motivated to make time to relax and have fun at night. But... the chores! So many of them await. What's a new mother/monster hunter to do? If up to me, I would never stop doing to-do's. K, on the other hand, won't even let me say the words "honey-do list;" he likes to thoroughly enjoy his evenings and weekends off from work. This may seem like a mix for trouble, but instead we balance each other out. K realizes that stuff has to get done but he hates seeing me stressed out, so now he helps me to prioritize our tasks for the week. I show him my massive "everything that's falling apart in the house" list, and he selects 4-5 things for each of us to complete. It actually works because as soon as I'm done with my chores (as well as a couple of extra for good measure ^_~), I really do feel like I can sit down and get my game on, guilt-free. Another thing K hates is when I give him tasks sprinkled here and there throughout the day because, well, that's the way I think: "Oh, this thing needs to be done! I'll just tell K about it right now or remind him for the 15th time." The result is that poor hubby is always on edge, thinking I'm going to ask him to do yet again something else as soon as he settles down to rest. The compromise is that we're adapting a tradition from his family – dedicating Saturday mornings as family chore time. You'd be amazed with how many to-do's you can knock out in 3 hours. And that way, you can enjoy the rest of your weekend! What are your best practices to get chores done, while still making time for some well-deserved, guilt-free R&R?